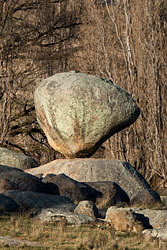 Balancing rock one of the most interesting rock formations in the Glen Inns region. Granite boulder with quite impressive size is resting on its’ edge among other rock formations just in the middle of the field. Stone is located on the private property, just 200 meters from the road. People say that there are other interesting formations in the Stonehenge Recreational Reserve, but as we haven’t been there cannot comment on that, but if you have a time – have look.